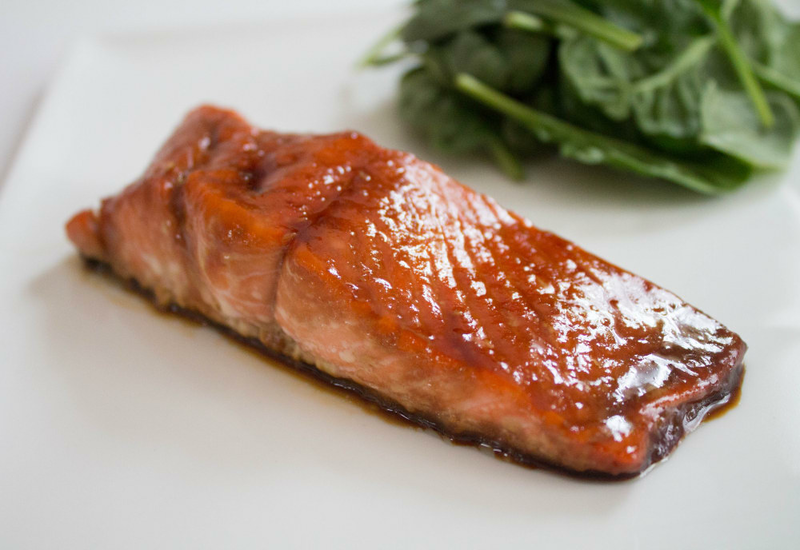 Wild salmon fillets are perfectly paired with a homemade version of Teriyaki sauce. It is a naturally sweet glaze, made with Tamari and maple syrup as well as garlic and ginger. This fish recipe is great for a weeknight dinner, a casual soiree, or even a nice dinner party. No one will believe it was made with less than 5 ingredients! This dish is also gluten-free and low-carb. How can you go wrong? Tamari is a type of soy sauce that is made without wheat - therefore it is gluten-free! This beautiful fish is great with your favorite salad, a side of rice, or stir-fried vegetables. Per Serving: 391 calories; 14g fat; 33.2g carbohydrates; 33g protein; 72mg cholesterol; 4100mg sodium. Made this for a lunch prep and it was really good chilled. Served it along side a simple salad and didn't really need to use a dressing for it. The sauce on the salmon helped flavor what otherwise is a plain, boring salad. I like to make a larger batch of the sauce to use on my beef fillets and shrimp. This maple teriyaki salmon is so yummy! The glaze is delicious. I served it over brown rice and it was perfect. This maple teriyaki salmon was so good! We are adding it to our weekly rotation. It goes great with rice and veggies, and my wife also makes this for our meal prep. It has a lot of great flavor and it's easy to prepare. I thought this recipe was good, but I should have used real maple syrup. I really liked the tamari and ginger flavors. I served everything over spiralized zucchini, delicious! Served this with a side of stir fry vegetables, it was so good. Also used soy sauce instead of tamari, so not gluten free but still really good.